We already learnt usage of constant timer parallel to requests to pause threads on all requests for given amount of time in my earlier post. 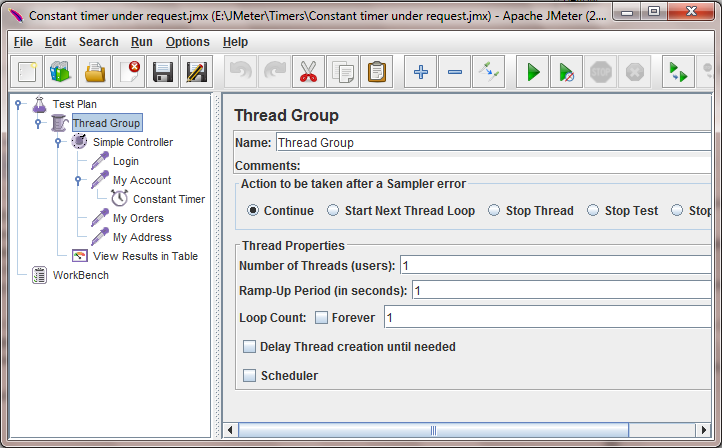 Also you can put constant timer under specific request of your software load test plan to pause thread on that specific request for given amount of time. 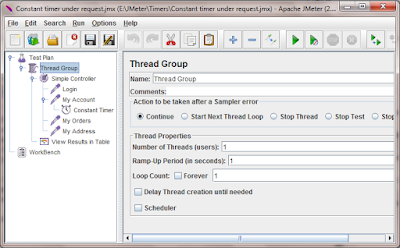 Let's learn how to pause thread on specific request of your software load test plan for given amount of time using constant timer. 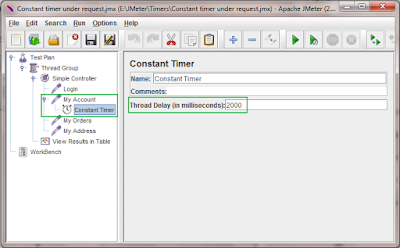 I have prepared very simple example to show you how to pause thread on specific request of your software load test plan using constant timer. 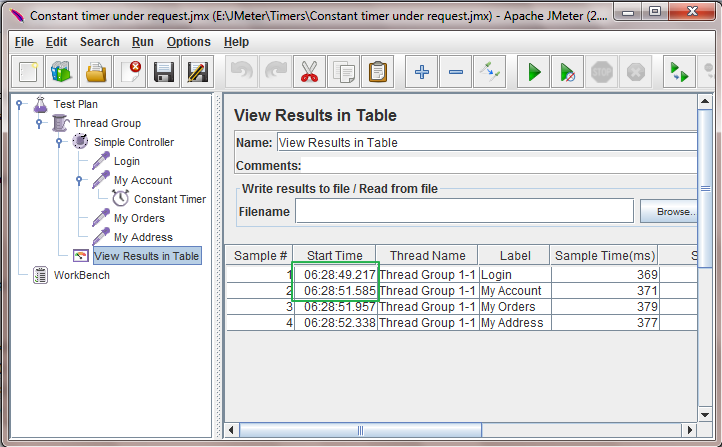 I have total 4 requests in my jmeter software load test plan as shown in below image. I wants to pause thread for 2 seconds on My Account request. All other requests should be executed without any pause. 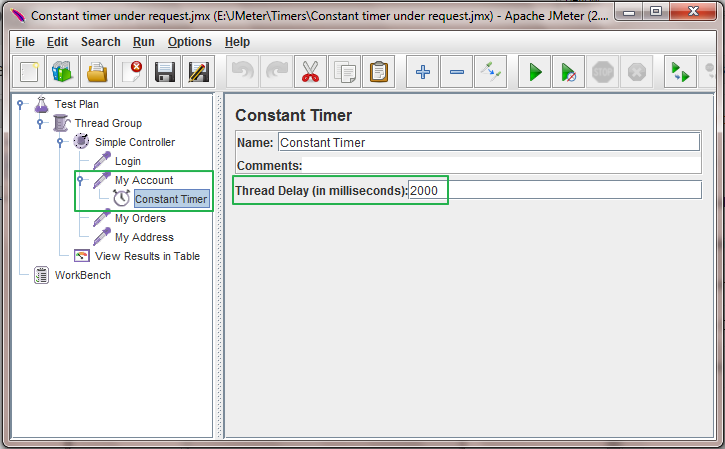 So i have added constant timer under My Account request only with Thread delay = 2000 milliseconds as shown in below image. Now if you run above test plan, result will looks like below. You can see that start time of My Account request = 2 + start time of Login request(06:28:49.217) + Sample Time(ms)(0.369) = 06:28:49.217. Also you can see that thread is not paused on any other request. 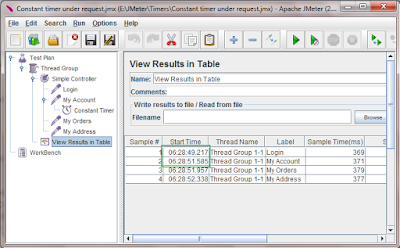 This way you can use constant timer to pause thread on specific request of your software load test plan for given amount of time.